DD 174/5 in 20 overs. RCB 176/4 in 18 overs. 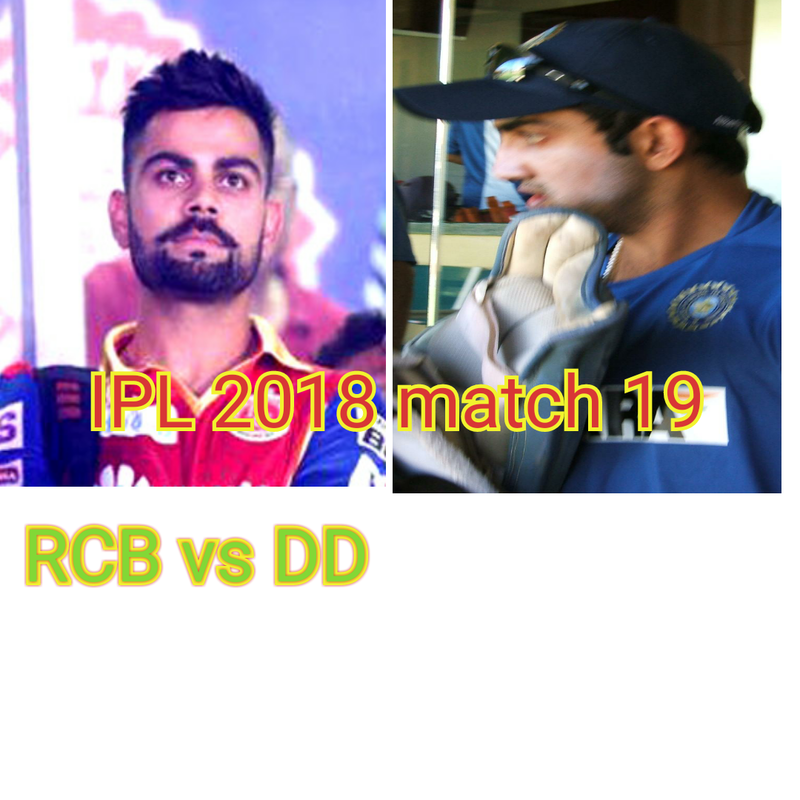 19 match of IPL 2018 being played between RCB and DD in M Chinna swami Stadium Bengaluru at 8pm on 21 April 2018. Both teams have played 4 matches and won 1 lost 3 match. Let's start the team arrangement and prediction. Both teams are hungry for 2nd win. RCB played 4 matches and have won only one same condition for DD. Quinton de Kick, Virat kohli (c), AB de Villiers, Mandeep Sing, Cory Anderson, Washington Sunder, Murugan Ashwin, Chris Worked, Umesh Yadav, Mohammad Siraj and Yajuwendra Chahal. Moin Ali probably replace one player. Jason Roy, Gautam Gambhir (c), Shreyas Ayyar, Rishabh Panth, Glen Maxwell, Chris Morris, Gurkeerat Singh/Jayant Yadav, Rahul Tewatia's, Mohammad Sami, Shahbaz Nadeem and Trent Bolt. It may rain or thunderstorms during match. Virat kohli against DD have scored 663 in just 16 inning while Gautam Gambhir have scored 644 in 19 inning against RCB. After looking this preview it seems RCB is better than DD. RCB won the toss and choose to bowl first. Manan vora replaced Sarfaraz khan. Jason Roy and Gautam Gambhir started the inning of DD. They lost their wickets very soon. But Shreyas Ayyar 52 of 31 delivery smashed 4 4s and 3 6s and Rishabh Panth 85 of 48 delivery smashed 6 4s and 7 sixes reached team to 174 for the loss of 5 wicket in 20 overs. Manan Bora and Quinton de Kock started the inning of RCB . Manan Bora lost his wicket very and scored only 2 runs. Quinton de Kock, Virat Kohli, Cory Anderson played great inning but AB de Viliers played amazing and blasting inning. He smashed longest six of IPL 2018. His great inning reached RCB to second win. He scored 90 in just of 39 delivery in which he smashed 10 4s and 5 sixes.